Sunday, May 14th was Mother’s Day here in the USA. During our annual Mother’s Day walk at a State park we came across these beauties! Lady’s Slippers! I had a lovely Mother’s Day with family. We had a few who sadly could not join us this year. I hope you had a lovely Mother’s Day too! Last week I challenged myself to use the Westalee Sew Steady Clam Shell quilting ruler. For me, there was a bit of getting comfortable holding the ruler in place while moving the quilt under the machine needle. I had a few jiggles where I didn’t stay snug up against the ruler, but all in all I’m pleased with the results. 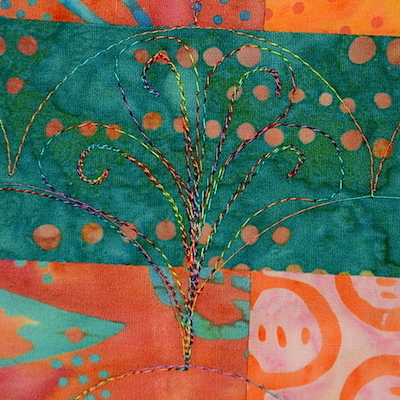 No ripping out, I kept the mistakes in the quilting. Simply Elegant is the name of the pattern for this table runner. Made with a 2 1/2″ strip pack, Tonga Treats, from Timeless Treasures. The clam shell design shows up better on the back. As I was quilting the clam shells, I got to thinking that it might be fun to go back and do some quilting inside some of the shells. Above is simple straight lines. This fill I’m calling petals. Pebbles or circles with smaller circle inside. I used a variegated King Tut by Superior Thread, color 921. Love it! 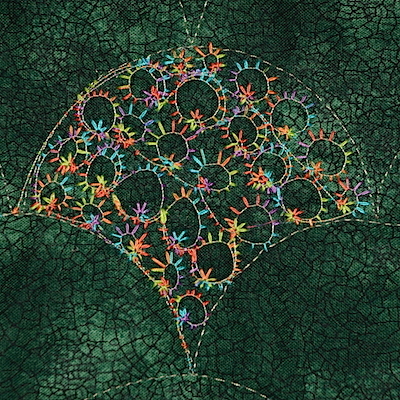 About three quarters of the way through quilting designs in the shells, I had a bobbin problem. I cleaned it up and went on my merry way. I didn’t realize I now had another problem until I finished the quilting and turned the quilt over! The tension got worse with each new fill design! But, I must say, I kind of like the look of the above mess! I’m leaving it! It’s on the back, the quilt is for my own use, and it will be a good example of what not to do in a future quilting class! I used Superior Thread, The Bottom Line, in Taupe in the bobbin. 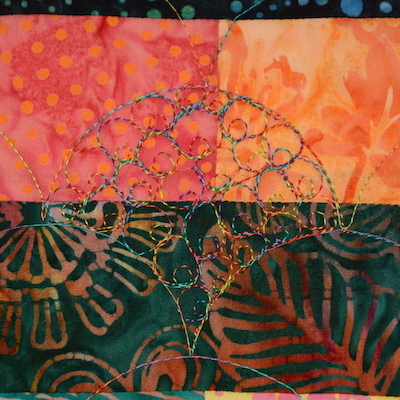 If you are interested in seeing more fills in quilt designs, take a look at Esther’s designs over at I Patch and Quilt. I just discovered her blog this past week! She has a series going on right now on FMQ samples. So much fun! 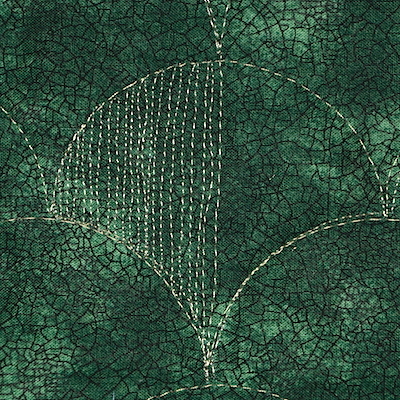 How has your quilting week been? 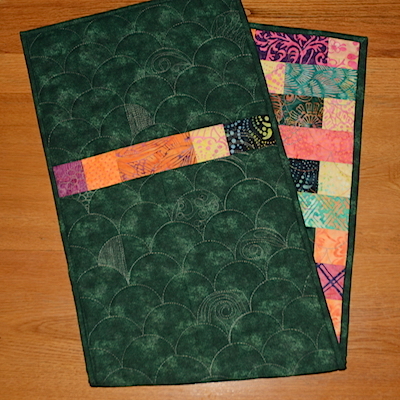 I’m having fun with my weekly goals this month of quilting up one small table topper per week! How did I do on last week’s To-Do List? Practice crocheting stitch – next step for Fusion Blanket. ✔️ But not anything I want to show yet! Quilt Simply Elegant Table Runner using a Clam Shell design. ✔️Clam Shell, and some fillers, and even got the binding on! Waiting for FMQ step for The In Box Jaunt Quilt-Along. ✔️ Next step was posted today. Sit Down Free Motion Quilters May BOM pattern is up and ready. Time to piece another block. ✗ Printed pattern, but have not worked on the block yet. Complete next step in the In Box Jaunt Quilt-Along. Sew up May block for the Sit Down Free Motion Quilters BOM. 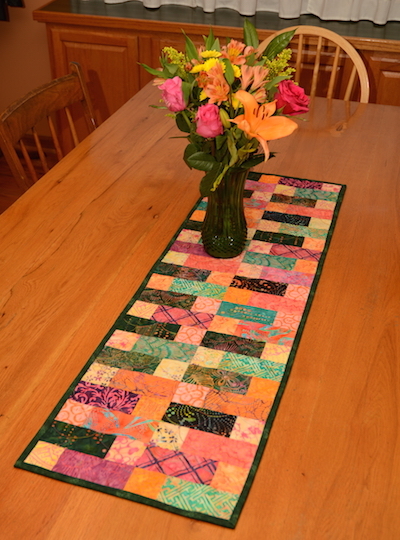 Quilt Dresden Plate table runner as part 3 of my OMG. I’m linking to To-Do Tuesday and Linky Tuesday. This entry was posted on Tuesday, May 16th, 2017 at 18:33	and is filed under Family, Quilting. You can follow any responses to this entry through the RSS 2.0 feed. You can skip to the end and leave a response. Pinging is currently not allowed. I am definitely going to have to look into that ruler. I love how it turned out! And, I have to say… I really love the back where the tension was off. I’d keep that too; It’s a great effect! 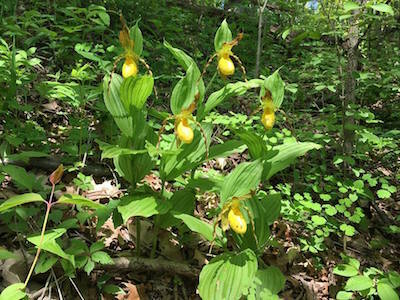 Love your photo of the Lady Slipper, or cypripedium. My sister has a VERY green thumb. She can propagate and grow anything it seems. Several years ago, a wild yellow lady slipper orchid appeared in her garden. She is sure “the birds brought it”, so to speak. It is so special to see it bloom near Mother’s Day every spring. She lives in Rapid City, SD. Fun seeing your discovery in the wild.